Maybe you had to get stitches in your forehead when you ran into that cupboard door or you have a haggard-looking gash that cuts straight through your eyebrow. Maybe you needed a lifesaving surgery and have the scar to prove it. Whatever the case, scar camouflage can help. 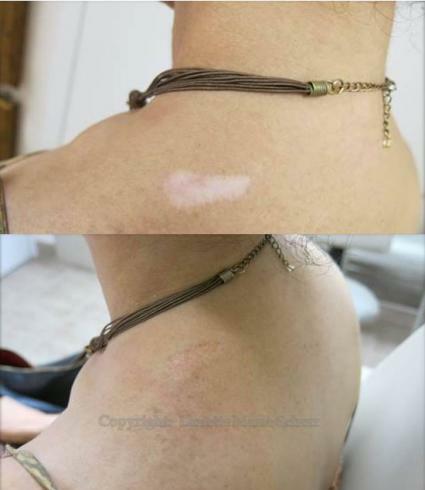 Covering your scar with a flesh-colored tattoo can come by many names, including scar camouflage, corrective pigment camouflage, and skin color tattooing just to name a few, but the most common term is scar camouflage. Scar camouflage is actually considered a type of non-surgical medical procedure where a needle is inserted into the scar and deposits inks that mimic the pigment of your skin. Since skin isn't just one solid color, the technician uses a pointillism technique to mix and match skin tones to add variety to the skin, masking the scar. Corrective pigmentation can be used on a variety of patients, including those with scars and burns, as well as on patients with skin pigmentation disorders and stretch marks. This is done with a machine that is very similar to, if not exactly the same, as those you would see in your run-of-the-mill tattoo parlor. However, this is a specialized tattooing technique that falls under permanent cosmetics and is typically completed by a specialized professional. Specifically, this tattooing technique is usually done in a specialized permanent cosmetic center or office that offers permanent cosmetic tattooing options and other treatments. This is also a treatment that might be available at a plastic surgery office or center. True to its name, scar camouflaging does in fact camouflage a scar to make it less noticeable. Does it get rid of the scar? No, but it will make the appearance much less noticeable. The technicians will use skin-toned pigments that contain Titanium Dioxide to make the scar tissue appear more like normal skin. This will create the optical illusion of the scar disappearing. While it will still essentially be there and you will still feel the scar, cosmetically it will nearly disappear. For scars that are on the face or those from masectomy procedures, this can be especially helpful in improving self-esteem. While this technique will work well on most small to moderate sized scars, the larger the scar the harder it will be able to mask. Additionally, different scars will take pigments differently, meaning that while one treatment might work for some, others might require several treatments and touch ups. It should also be noted that some scars might absorb the pigments unevenly, making the treatment ineffective. Another thing to keep in mind with burns is the fact that the flesh colored tattooing can only even out the pigment. If the texture of the skin was affected, this will not be able to mask that. Tattooing might cover a large scar, but there are several things that you need to take into consideration, according to Prettyology. The width of the scar will need to be considered along with the area. For example, is there hair in the area? Covering up a gnarly scar through your eyebrow might work effectively because the hair in the area can easily be added and work to mask the scar. Additionally, scars on or near the hairline might be easier to disguise because you can use tattoo to mimic the hair. A scar in an area like your arm or leg might make it more difficult to play Houdini because the hair there is constantly changing. While it is possible, there are several different things that the technician will need to consider to determine if inking the area will work the best to mask the scar tissue or if another option might need to be considered. Scars do not discriminate, and the treatment options don't either. Tattooing flesh tones into scars to blend them into the surrounding skin will work well on all races and skin shades. There are even clinics that specialize specifically in ethnic skin. According to The Nouveau Clinic, depending on the pigmentation of the skin, specialized treatments to bleach the skin might need to be used prior to the repigmentation process for best results on people of color. 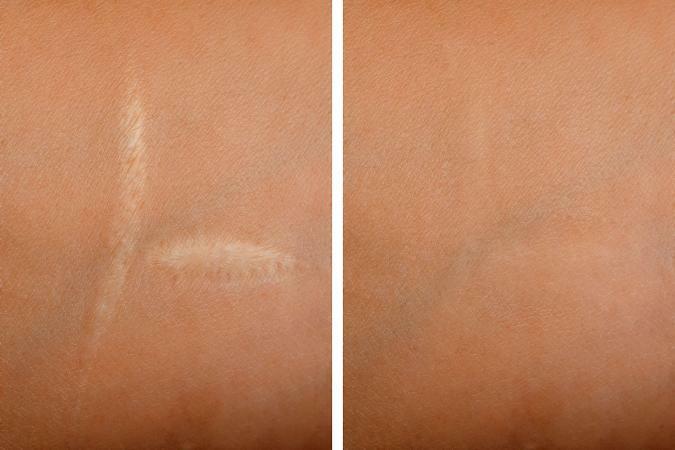 Covering up your scars can be expensive, with costs ranging anywhere from $300 to over $1,000 to cover your scar. This depends on the size and severity of the scar as well as how many sessions are required. According to CostEvaluation.com, permanent makeup tattooed on scars will cost about $350 an hour. This site also notes that one scar might take four or more hours to cover. The costs will also vary by location, and many centers can't offer a definitive price until they have seen the scar. So you're staring at that scar on your forehead again and wondering if permanent makeup might be for you. There are a few things that you'll need to consider to get the best results. The scarred area needs to be healed. Most clinics note that the scar should be older than 9-12 months. Additionally, the color within the scar should have been the same for a while now. If it is still changing, then it's not completely healed. Scars without edges or that are hard to see the borders of typically work the best. For those that have a dark edge or border, tattooing can actually magnify the problem. You'll also want to examine the texture and appearance of the scar. Is it smooth? Then it might work well. If it is bumpy or textured, like a keloid scar, then permanent tattooing might not lead to the results you are hoping for. Tanning will darken your skin. Just like your scar doesn't tan, neither will your tattooed skin. Therefore, this might not be the best treatment for those that frequently tan. It is pivotal to understand that tattooing the skin will not renew it to its original state; it will hide the blemish, but your expectations must be realistic about the treatment before going into the chair. Additionally, you must understand that most treatments will take multiple sessions to truly hide the blemish. As with all tattoos, these tattoos might fade and require touch up sessions as well. While scars are anything but skin deep, scar camouflage or flesh colored tattoos to hide scars are available to cover your scars from the world. While this treatment does have its limitations, and the scar will not disappear completely, for mild to moderate flat scars, they will blend well into the rest of the skin quite nicely. Now that you know the basics, you can find out if this is a treatment that will work for your blemishes.